it again. 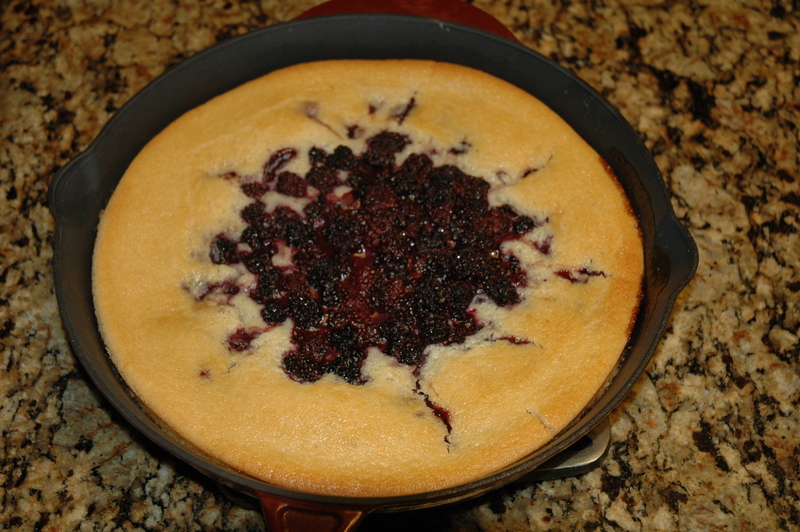 I have never tasted a better cobbler than this blackberry cobbler recipe. I will bet that raspberries, ollalieberries or others may work just as well. For those of us in the hot, humid, nasty, ugly and miserable weather down here in Houston, blackberry season was gone 2 ½ months ago. I will have to buy some frozen berries, yes I know it is almost sacrilegious to buy store bought berries but these are desperate times! is a pretty Loge red enamel model. Enjoy! Generations of Southern Cooking (Ten Speed Press, $32.50). masher. Sweeten with extra sugar if you like. Whisk flour, baking powder, salt and 1 cup sugar in a medium bowl. In another bowl, combine milk and vanilla. Gradually pour wet ingredients into dry while whisking. spatula, scrape the berries into the center. Bake cobbler till it is golden brown and a cake tester inserted into the cake (not the berries) emerges clean, about 1 hour. Serve warm with vanilla ice cream (Bluebell is the best) — and prepare for a walk down memory lane. Please excuse the formatting….. can’t figure it out!